Miller on The Spirit movie: "More fights, no tights"
The Hollywood Reporter's daily video report from Cannes has a video interview with Frank Miller about The Spirit movie. See the online video here. The Spirit #5: Pork Beans cover controversy! On his blog, 'Comics Oughta Be Fun! 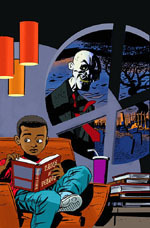 ', Bully digs up a "canny" link between a classic Eisner splash page and issue five of the new DC Comics The Spirit series by Darwyn Cooke. See for yourself! Then imagine it all being over and one of your fellow judges, in this particular case, Chris Reilly, basically succumbing to Eisner fatigue moments after Jackie Estrada has said, â€œNo, no oneâ€™s ever had a medical emergency during judging.â€ Chrisâ€™s finger pointed to the ceiling, arm rigid, strange cry, eyes rolling back, caught by fellow judge James Sime as he fell. A squadron of doctors in the pub calmly coming to his aid and, after being rushed to the hospital late on the last night, waiting in a David Lynch emergency room with puke green 1970s chairs and Steven Seagal interrogating someone on the TV using extreme surgery. Dave McNary previews the Cannes Film Festival and it looks like the big winner will be anything with Frank Miller's name attached... like The Spirit feature film. Watching this movie really open up the floodgates of my memories of the late 1970s and working with him as a teacher. He was definitely tough, but he tried to instill in us to try and go beyond comic books, and tell stories that were more than just superheroes punching each other!